Another Woman is the first book I have read by Penny Vincenzi and I was not disappointed at all. In fact I found it an incredibly enjoyable but intriguing read! This is one of her earlier books though, written in 1995, and it always seems strange these days to read a fairly contemporary novel where there are no mobile phones! It goes to show how even novels become dated! Anyway, back to ‘Another Woman’. I was firstly drawn to the title, wondering who indeed was this ‘another woman’. It turns out that she is Cressida, who disappears mysteriously the night before her lavish wedding is due to take place. Interestingly, we never meet Cressida in the story, although she is about somewhere at the beginning. In fact this story is not really about Cressida at all – it is about her family and friends, their complex relationships with her and their differing reactions to her strange disappearance. As they learn more and more about what has happened they discover that they did not really know her well at all, in fact she is not the woman they thought they knew but ‘another woman’ completely – hence the title! One of the things that I like about this novel that, from start to finish, everything happens within 48 hours, which makes it fast moving and pacy! In this way it is a bit like the television series ’24’ but without the threat of international carnage! Throughout this timescale, and through the eyes of all the main characters we do find out an awful lot about Cressida, as they gradually piece together the events leading up to this fateful day. Each chapter is entitled with one of the characters’ names and also the time of day that it is starting. Some of the timescales overlap but this only makes it more interesting. One of the main characters is Harriet, Cressida’s elder sister. She has always grown up with the feeling of being the less favoured daughter, and she also has uneasy feelings that Cressida is not all she seems. Perhaps, she is the least surprised by Cressida’s disappearance and the ensuing revelations. Over the two day period, she also has to deal with major business problems, confronting her feelings about a former lover, and discovering some devastating truths about her father. She is, in my opinion, one of the more sympathetic characters in the book, and you can’t help feeling that you do want things to turn out well for her! Some of the other major characters include Cressida’s father James, his best friend Theo, Theo’s son Mungo and Tilly, a beautiful model who is caught up in all the mess. These are the stories that you find yourself drawn to as a reader, as you discover just how complicated and interweaved all their lives are. Affairs, proposals, health scares, anger and jealousy – they are all there! Some of the characters you will like more than others; some do not behave very well, but I do feel that they are all recognisable, and we probably all know people like them. I did feel, as I was reading the book, that the characterisation was particularly good and one of the aspects that made it so readable. At the start I did feel a little confused trying to work out who everyone was but it did not take long to fit all the pieces together and from then on it was a thoroughly enjoyable read. Towards the end the pace moves up a notch, which for me made it quite ‘unputdownable’! You do feel that the ending is quite conclusive, although there is also a final twist at the end! With 550 pages Another Woman is quite a long book, but it is an easy and enjoyable read. 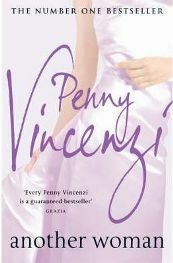 Having read this, I will definitely be on the lookout for more books by Penny Vincenzi! No Comments on "Another Woman"